Look, there are plenty of non-dairy milk options you can try! There are a lot of dairy alternatives available in your grocery store – and for god reason: There’s a need because so many people are sensitive or allergic to dairy. But, Milk and dairy products have fundamentally changed quite a bit in the last 50 years and its not milk as it once was. There are many changes that have taken place in modern agriculture and milk production that we as consumers need to be aware of before consuming. According to USA Today approximately 60% of adults cannot digest milk. About 75% of the population is lactose intolerant (they don’t produce the enzymes to digest lactose). A majority of the population is allergic to milk although the allergic reactions may not be obvious. This harms your digestive system and immune system over time as you continue to consume it. Believe it or not the promoted “Bone-Building Milk” is actually harmful to your bone structure. The milk actually has a calcium leeching effect. There is a good amount of calcium in milk but because of the pasteurization process only a small percentage of the calcium is actually absorbed. Furthermore, milk is slightly acidic and acidifies within the body. When this happens, your physiology looks to buffer or neutralize this acid and the most available source is the calcium in the milk. As the calcium is used to neutralize the acids and the ability to digest the milk goes down…you see, calcium can only be absorbed with the help of digestive acids. So, the calcium in milk (to do your body good) initially has a net neutral or zero effect on increase calcium with in the body. But, if you consume a lot of dairy and milk, the net effect is actually weaker more brittle bones because as the body’s acidity increases (from consuming more and more), more calcium is needed to buffer that acidity…and the best place to find a store of calcium is from your muscles and skeleton. Believe it or not, statistics show that countries with the lowest consumption of dairy products also have the lowest fracture incidence in their populations as well. Milk used to be full of healthy gut bacteria which was helpful in adding our digestive tract’s ability to digest it and in overall immune health, but now it’s pasteurized. Pasteurization is a process of super heating milk and its purpose is to kill microorganisms. The problem is, it kills all the beneficial bacteria that your gut needs to digest dairy and to stay healthy. Pasteurized dairy is void of the healthy bacteria and the enzymes that make dairy proteins easier to digest. (Casein and Whey proteins from dairy are difficult for humans to digest…cows after all have a 4 chambered stomach that helps them break down those proteins. This is why studies show that people who drink milk gain more weight and have more allergy type symptoms and inflammation than those who do not. Today’s milking cows (at least in America) are pumped with antibiotics to prevent disease and mastitis and are also given growth hormones to be bigger and produce more milk. The problem is that these hormones and antibiotics are also found in the milk we drink and they disrupt your gut health even further and weaken immunity. In several studies children who drank cow’s milk had more acne than those who didn’t. Because milk is now a toxic by-product of sick, medicated, hormone injected cows the nutritional value is very low. So we are taking milk that is full of hormones and antibiotics and then pasteurizing it which removes most of the nutritive value. Skin conditions such as acne, psoriasis, dry flaky skin, or rashes could be caused by milk consumption. I have worked personally with hundreds of people and one of the biggest changes I recommend is to get off dairy milk. A large percentage of people saw a large majority of their acne clear up with just this one change. Hormones in milk such as IGF-1 (insulin-like growth factor) may increase the risk of prostate, colon and breast cancer. You also have to keep in mind that milk is acidifying within the body and is difficult to digest. Your body becomes more acidic, the immune system is weakened and the gut is inflamed more often. This chronic inflammation spurs on symptoms from autoimmune diseases such as arthritis, psoriasis, lupus, allergies, IBS and IBD, Crohn’s disease to name a few. All of these put your body into a state where it can more easily develop cancer. It suits an environment that cancer can thrive in. Milk also contains a lot of lactose…this is SUGAR people. Sugar increases inflammation,a nd inflammation increases water retention (weight gain), allergic responses, and decreases your immune response. Did you also know that there are many cancer forming compounds in typical cow’s dairy milk. With all of this being said, what can you drink? There are better forms of cow’s milk available such as Organic Valley milk, the milk is still pasteurized though. I question that dairy milk can be more beneficial than organic rice milk, coconut milk, almond milk or hemp milk. I personally recommend avoiding soy milk because there are issues with soy as a “food” in and of itself, that’s for another day though! If we put everything else aside, dairy is high in calories. Once ounce of cheddar, for example (that’s the size of a pair of dice) contain 113 calories!!! When patients come to me with chronic ear infections, chronic skin conditions, digestive troubles, autoimmune diseases, and inability to lose weight, fatigue and foggy thinking, one of the first things I do with them is tweak their diet and remove foods that sit high on the food allergy list and dairy is in the top 5. On a personal note, if you know me, then you know I travel to other countries a lot! 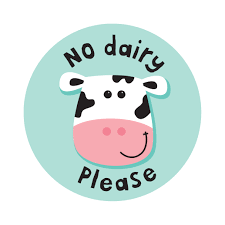 For years I have been dairy free because of a dairy allergy that causes overnight weight gain, water retention/inflammation, and skin break outs. (My breakouts were, by the way, are in a hormonal pattern on my face, hairline and neck and sometimes the tops of my shoulders.) For years I have been conscious to avoid dairy for these reasons and when I do, I maintain my weight effortlessly and have no skin issues. But in my travels in the past several years, I found myself sampling dairy from France, Holland, Spain, Italy, Switzerland, Croatia, and have found that I have none of my usual symptoms when I consume chees and other dairy when in these countries. It made me re-think my casein allergy and now I really believe that my body’s issues with dairy only pertain to the manufacturing process of dairy in America and (some other countries who use some of the same practices). Now, I strictly avoid all dairy made in the US and some other countries but even though I can get cheese made in France, I still limit my dairy intake because of the high calories. If you need help sorting out your diet, uncovering hidden food allergens, balancing your hormones, and calming your digestive tract in order to get healthy, I am here to assist and guide you.